Is there any useful tool to retrieve deleted contacts to iPhone 7? How to recover iPhone 7 lost contacts? Read here to get back deleted contacts to iPhone 7 at ease. Is there any useful tool to help me retrieve deleted contacts to my iPhone? Some contacts are gone from my iPhone and I really need them. SO please recommend a useful recovery tool for me to get back iPhone lost contacts, I don't have backup. Thanks. With contacts, we can establish a social network with others. But when contacts are deleted from iPhone, and the worst thing is that you don't have any backup, how to retrieve deleted contacts back to iPhone 7? Is there any useful tool to recover iPhone lost contacts? The answer is absolutely yes. Here, we will recommend a great iPhone contacts data recovery tool to help you get back deleted contacts to iPhone at ease. As mentioned above, I will introduce a useful iPhone contacts data recovery tool here and this software is named as iFonebox. As the best iPhone data recovery software, iFonebox enables you to retrieve deleted or lost contacts, text messages, notes, wechat messages, whatsapp messages, calendars, etc, from iPhone or iPad directly. Also, if you have an iTunes or iCloud backup for those lost data from iDevice, iFonebox supports to extract and restore them from iPhone backup selectively without erasing any data on your iOS device, compared with the process of restoring from iTunes or iCloud backup directly. Plus, you can transfer found contacts back to your iPhone directly via iFonebox, the same as text messages and notes. Next, I will share detailed steps to retrieve contacts from iPhone directly even no backup. The first step is to download and install iFonebox on your computer. There are two versions optional: Windows version and Mac version. How to retrieve deleted contacts to iPhone 7? em>Preview and select lost contacts to recover. 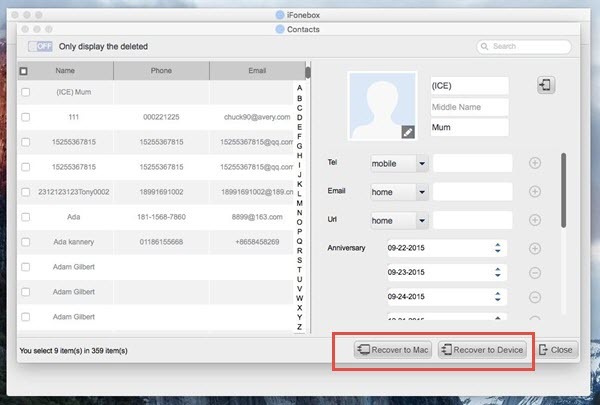 Now you have the chance to view those scanned contacts and then, select them, click Recover to Device button to transfer all found contacts back to your iPhone directly. Notes: You can choose Recover from iTunes Backup or Recover from iCloud Backup to get back lost contacts to iPhone selectively within the help from iFonebox if you have the backup data.